Bearcat Fans.... If you are heading to Morgantown this weekend stop by our tailgate for a beer and a bite to eat. Look for the Ultimate Tailgate Trailer in the Green Parking Lot (Across from Applebee's) on Van Voorhis Rd. Morgantown, WV 26505. 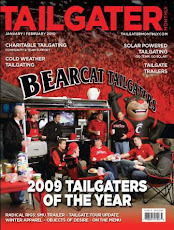 The UC Alumni Association is sponsoring this parking lot for all Bearcat Football Fans. We hope to tap the first Keg around 3pm and keep the festivities rolling until kick-off. If you are not making the trip to Morgantown we encourage you to watch the game at the Holy Grail Tavern & Grill in Clifton.... Great Eats and Ice Cold Beer! Go Bearcats !! Beat WVU! !